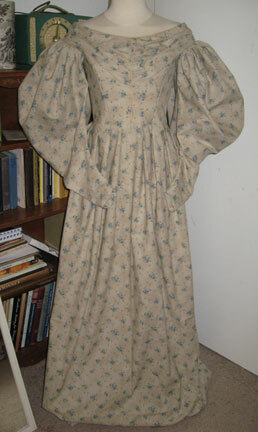 In hopes of going to upcoming costume events, mostly inspired by Charles Dickens, Elizabeth Gaskell, and the Tasha Tudor costume collection I started an early 1830s day dress. After working on it most of the day, I’m feeling pretty productive. 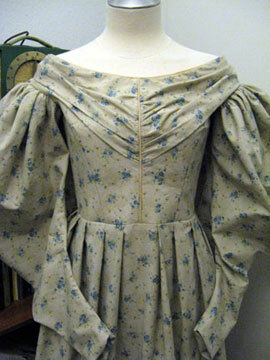 The fabric was purchased on clearance at Joanns for $1.50 a yard, and the pattern is Truly Victorian’s 1830s dress. 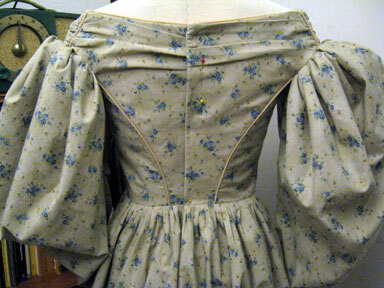 I still want to make a belt for the dress, and it needs closures and a hem at both the sleeves and skirt. I’m hoping to make a pereline and possibly a hat from this pattern. Of course, this brings to mind the unfinished corded petticoat project from a few years back and the wish I have of making a romantic era corset, sleeve poufs, and a little horsehair bustle. Someday!